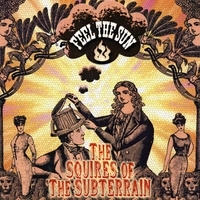 Though it seems from the name on this CD as if the Squires of the Subterrain are an actual band, the “band” is actually made up of one person, known in music circles as The Squire. Though the Squire physically hails from Rochester, New York, spiritually and mentally the Squire originates from about 1967-1972, as the music he creates is influenced quite heavily by pop bands from that era such as The Beatles, The Zombies, The Kinks, David Bowie and even The Beach Boys. At least, that’s the impression I get from listening to his music. The man behind The Squire persona is actually Christopher Earl (born Christopher Earl Zajkowski), a brillaint musician who, while playing in numerous bands in the Rochester area was creating some brilliant pop while sequestered alone in his basement (hence the derivation on “subterranean”) lair and releasing it on a series of acclaimed cassettes as the Squires of the Subterrain. As an XTC side project was called The Dukes of Stratosphere, there is now The Squires of the Subterrain. Zajkowski began his musical career by playing drums in a band with some high school chums, eventually morphing into a Rochester band called The Essentials, and by 1992 into a band called The Salamanders. The Salamanders developed a decent following in the Rochester area and even received a chance to play with some of the musician’s in James Brown’s famed ’60’s band. The Salamanders released one album before disbanding and Zajkowski went on to become one-half of country duo The Rosey Beats as singer and spoon-player(!!). Eventually, this band accepted another member into the fold and turned into a trio, calling themselves The Hi-Risers and playing roots rock comparable to Whiskeytown and Uncle Tupelo. All during this time Zajkowski was releasing homemade cassettes by his fictional group Squires of The Subterrain on his own Rocket Racket Records imprint. After the relative success of the first CD of Squires of The Subterrain material (culled from his various cassette releases) entitled Pop In A CD which was released in 1998, Zajkowski abandoned all of his other bands and side projects in order to devote himself to his Squires of The Subterrain project. Since then Zajkowski has released at least one new CD a year of Squires material including a great album released in 2002 pairing Zajkowski with eccentric British rocker Pete Miller called Big Boy Pete’s Treats. Zajkowski’s newest album under the Squires moniker has all the elements fans of great ’60’s music are sure to like. The great songwriting is there. The instrumentation is top notch (all done by the mighty Squire himself), and it all sounds great, no matter if it’s a garage-y type song or the lead-off song, which is a Sgt. Pepper-like pastiche of “60’s psyche. What makes Zajkowski’s music feel real and true and not just a genre exercise is the craft he puts into every song – the time he painstakingly spends lovingly creating each track to make sure everything fits and sounds correct. Fans of the Squire may notice the artist has lately begun expanding his musical vocabulary a little past the ’60’s on his releases. Zajkowski has recently seemingly embraced the glam rock sound present in Marc Bolan’s (of T-Rex fame) and David Bowie’s work to create glam rock masterpieces of his own. The slight change in Zajkowski’s vocabulary is a welcome one, not that the psyche and Beatles sounding tracks aren’t great, but the fact Zajkowski is continually adding new elements and nuances, constantly refining his sound is always wonderful to hear. That everything he does sounds great is a testament to his genius. Psychedelic rock fans will love this stuff. Not only does the Squire adhere to the sound and feeling of vintage ’60’s psychedelic rock but it’s so deeply ingrained into his being that his music doesn’t come of as a slavish copy or just a genre exercise. The Squire’s music comes off as something recorded during that time and is just being revealed to us now, which is a testament to how much love and craft The Squire puts into his music. No small touch is spared if it adds to the song and because The Squire is playing near every instrument on his records, every note is preovided with a dollop of love and devotion. Pick this up and relive the days when seemingly every album had new innovations and very little sounded the same.